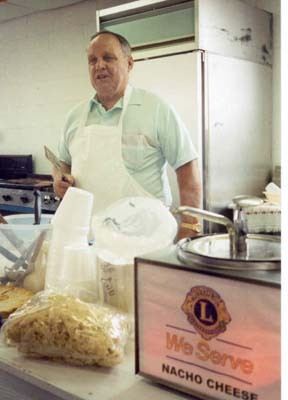 Location: Luciano's Restaurant, 103 W. Ludington Ave.
we are sorry to report that as of 6/30/08, the Ludington Lions Club will be disbanding. to preserve some of our history for all to see and remember. We wish to thank all those persons and local businesses who gave us so much support. * Provide eyeglasses and exams to those in need. provide & serve food at "Blessing of the Animals"
and a Talking Blood Pressure Monitor ($149.95) to a deserving local person. 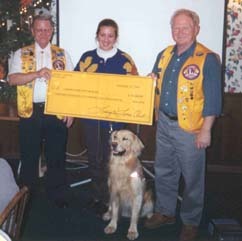 Nov. 11, 2000: Ludington Lions present a check for $18,500 to the Leader Dog School for the Blind of Rochester, Michigan. 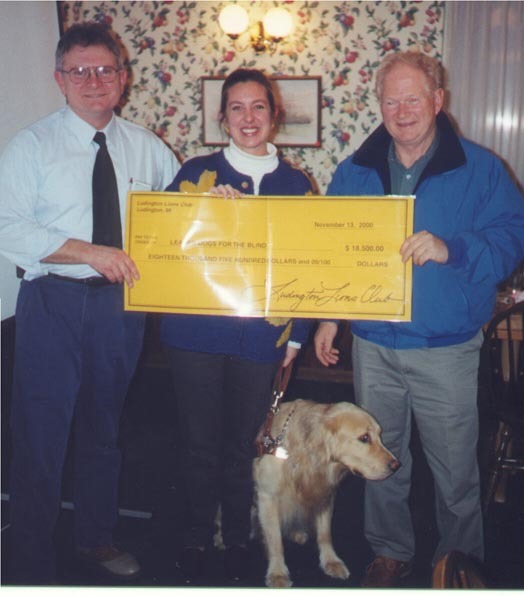 Lion Al Hardman, on the right, competed in the 2000 Iditarod Race in Alaska, an numerous fund raisers were held in conjunction with this. 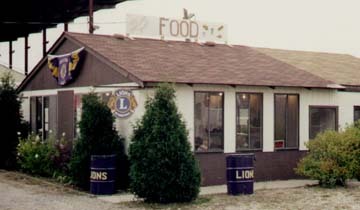 Each year, the Ludington Lions operate this food building at the West Michigan Fair. For the 2001 fair, we earned a profit of $4823. Action at the West Michigan Fair, 2001. Shown (left to right) are: Frank Longmore, Lori Longmore, and Dean Parker. We served some breakfast food, a varied menu of lunch items, and a different dinner special each day. 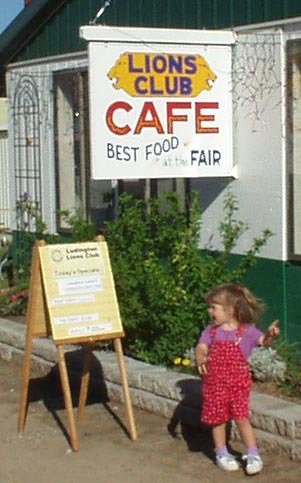 One of our younger customers "points the way" to good food. 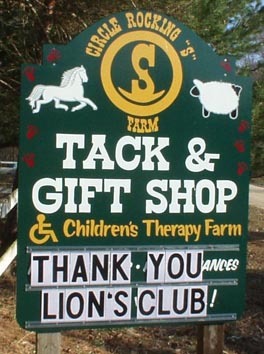 For 2003 we and the Fair Board made many improvements to the restaurant building, including a new sign. 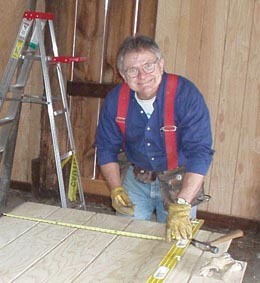 An action photo from 2005. 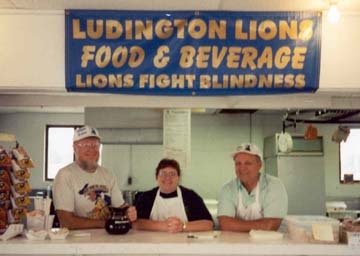 Left to right: Lions Gary, Lisa, Mike, Leslie, and chef Bill. This March (2004), Lions Bill Bowne and Frank Longmore went out to the Circle Rocking S ranch to do some construction and general repairs. 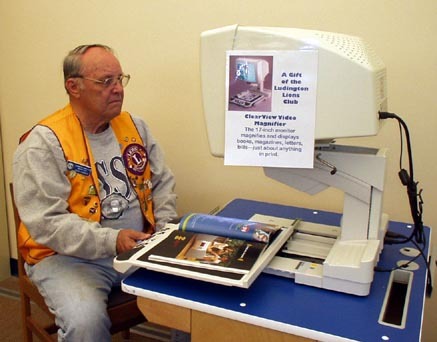 Lion Bill "measures once, cuts at least once"
Lion Dean tries out the new Optelec video magnifier we bought for the Ludington Library. Since then we have assisted several other pesons in selecting and obtaining such devices. 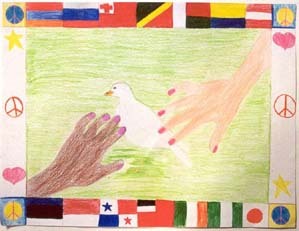 This was the winning entry in our local (Ludington) Peace Poster Contest for 2001. It competed up to the District Level. We really enjoyed judging the great entries we received. 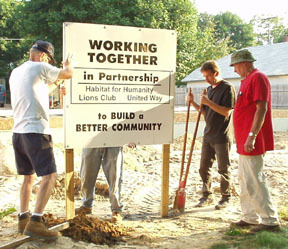 A major project for 2002 was that we sponsored a grant from LCIF to build a Habitat For Humanity house here in Ludington. It was a great experience for all. A big thanks to Lions Lori Longmore and Leslie Bowne for working through the grant application process. Hardman Construction (Lion Al) provided the site excavation, Westshore Welding (Lion Bill) did some welding of beams, and Lion Frank Longmore was voted Habitat Volunteer of the Year. Thanks also to our great local newspaper, the Ludington Daily News, for their fine coverage of the process. Groundbreaking was June 2, 2002, and the house was completed and dedicated November 17, 2002. To see a complete photo history of the house construction, click here. At a zone meeting, our newest member, Heather, talks about the future leader dog she is currently raising.